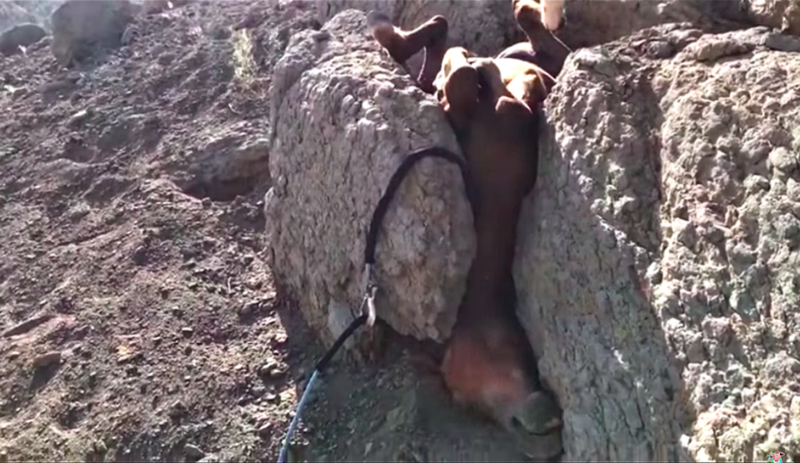 It’s the scene of a daring rescue by men passing by who happened upon a bizarre scene: a horse stuck between two boulders with its legs in the air. Not knowing if the horse was seriously injured as its head appears to be wedged hard between the two rocks, they jumped into action. Using ropes attached to their car and some muscle power they embarked on an extraordinary rescue. Thankfully it was captured on video which immediately went viral with hundreds of thousands of shares. You’ll understand why when you see the dramatic scenes in the video below. Who knows how this poor animal became trapped in such a bizarre way but it must have been terrified, in such sparse land trapped near Aktau, Kazakhstan, and all alone. The animal rescuers attached a rope to the side of the boulder and their car and with a vehicle and some man power they begin to dislodge the rock which is trapping the frightened foal. Despite using their SUV to dislodge the rock, one of the men uses muscle power to pull the rock away and let it tumble down the rocky slope. As he stands back to let the foal get up, unsure as to what state she’s in, it’s a wonderful sight to see her jump into action and get back on all fours. She seems a bit groggy and I’m sure she was probably dehydrated but she was free at a last. Thank goodness these animal heroes stopped to help this poor frightened foal. Watch the incredible rescue in the video below. If only animals could talk! Please share this video with all the horse lovers you know.